Most families choose Metro Catholic School because WE EMPOWER DREAMS by preparing children for the real world. Every child and faculty member contributes to what makes Metro Catholic so special. Even across 2 campuses and 3 buildings there is a close-knit feeling that gives students the opportunity to get the education and services they need to succeed. They are also encouraged to try new things - art, writing, sports, service, etc. with the support of a wonderful and committed faculty. ~ Provides a wide range of specific programs to address learning challenges in an encouraging and nurturing environment. ~ Helping children from many different backgrounds discover their own gifts and talents. ~ Faculty that connects to student as well as the family by getting to know them as individuals and respecting all. "I cannot thank you enough for all that your school did for my two children. Metro Catholic accepts students of any race, color, ethnic origin, faith or income level. Preference will be given to siblings of students who are already enrolled. All students are encouraged to participate in the Catholic educational experience and to be nurtured to reach their potential. The acceptance of any child into Metro Catholic School depends on the school's ability to meet the child's educational needs. Admission is made through formal registration. The following is required: birth certificate, baptismal certificate if applicable, a current progress report if applicable, a record of physical examination and all required immunization and health forms. In the case of students transferring from other private schools, all financial obligations must be met at the previous school before acceptance. $8,500 is the estimated real cost of educating one child at Metro Catholic for 2019-2020 school year. 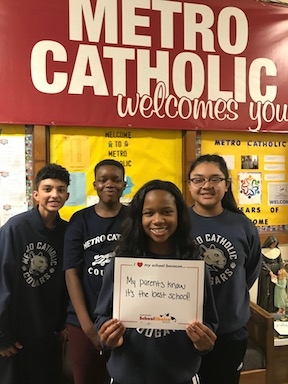 Metro Catholic School is committed to providing an affordable quality education to children who need it the most, so financial aid is individualized and based on need, just like the curriculum. Administrators use information provided through a third-party income verification process along with each family’s circumstances when making financial aid decisions. Metro Catholic School also accepts vouchers from the Cleveland Scholarship and Tutoring Program (CSTP) and the EdChoice Scholarship Program. Tuition typically covers a portion of Metro Catholic School’s operating expenses (approximately $8,500 per child per year). Parents generally pay only a portion of that full per pupil amount. Donations from individuals, foundations, corporations and organizations help cover the balance. This financial support is essential for Metro Catholic School to remain a model of education and to continue providing students with the knowledge and skills necessary to lead fulfilling lives. Current State School Vouchers (Cleveland Scholarship and Tutoring and Ed Choice Program) cover full tuition. CSTP is a State of Ohio Education “Voucher” Program for qualifying families residing in Cleveland who want their child to attend a private or Catholic school in Cleveland. Applications are available at Metro Catholic School. Diocesan Tuition Assistance Inquire about the FACTS application. This information helps to determine possible financial assistance from the Catholic Diocese of Cleveland. Metro Catholic School tuition assistance. Parish Sponsorship If you belong and are an active member of one of the following Catholic Parishes, you may be able to receive assistance with your education costs: La Sagrada Familia, St. Augustine, St. Barbara, St. Boniface, St. Colman, St. Michael, St. Stephen. Contact your pastor. Gifts Family members sometimes give donations toward a child’s education for special occasions such as birthdays and Christmas. Just ask family and friends to call the Advancement Office (216-634-2854) and indicate in which amount the gift certificate should be made. Girls: Gr. K - Gr. 8: Skirts, jumpers, or slacks are navy blue. Blouses or knit polo shirts are solid white, light or navy blue. Dark brown or black school shoes. Boys: Gr. K- Gr. 8: Dress Slacks are solid navy blue. Dress shirts or polo shirts are solid white, light blue or navy blue. Dark brown or black school shoes. School shoes are to be neat, being all black or dark brown in color with NO stripes/markings/logo or white sole rim. Tennis shoes of any color or ones with white rim are permitted on gym days only. Pictures of all appropirate uniform and school shoes are available in each building office.